Open doors until 4 January 2015! Horta Museum in Brussels awarded European Union Prize for Cultural Heritage / Europa Nostra Awards. The award ceremony for the European Union Prize for Cultural Heritage / Europa Nostra Awards was held in the Horta Museum in Saint-Gilles, Brussels, on 10 October. The Museum itself was honoured with an award for its conservation project, conducted over twenty-five years by the architect Barbara Van der Wee (IP/14/283) and with a master plan dating from 1989 that encompassed the complete renovation of the building. The permanent exhibition "Palau Güell: a look at furniture" will officially open on 7 November in Palau Güell. The Palau Güell has set up four rooms dedicated to furniture for this exhibition, including a selection of original decorative elements from Palau Güell and furniture items representing the main Modernista designers. The exhibition will also display two pieces designed by Antoni Gaudí until 12 January 2015. Antoni Gaudí´s Palau Güell is listed as a UNESCO World Heritage Site and is owned by the Diputació de Barcelona. In coupDefouet 23 we celebrate the 100 anniversary of Ödön Lechner´s death with several articles on the life and work of the father of Hungarian Secession, we visit the gardens La Tropical, an old Art Nouveau jewel, we visit the magnificent Ziemelblazma palace in Riga built by the Latvian philanthropist Augusts Dombrovskis ... and much more! If you become a member of the Art Nouveau Club now, you will receive your free copy of this issue. Join us and enjoy the advantages! Go to www.artnouveau.eu/en/club.php for more information. 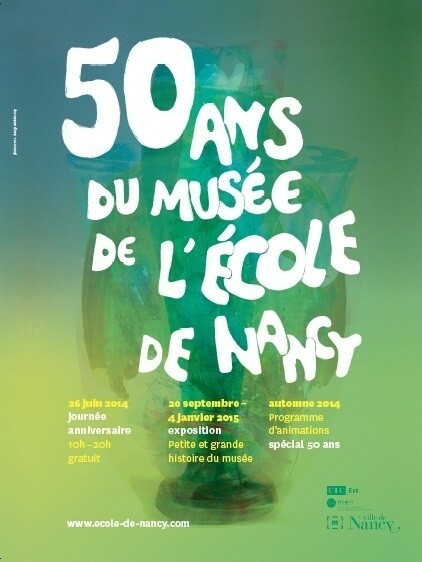 The Museum of l'École de Nancy Celebrates its 50th Birthday! A beautiful day contributed to make the celebration of the 50th aniversary of the l'École de Nancy Museum a radiant event.